Explosion Blast Response of Composites contains key information on the effects of explosions, shock waves, and detonation products (e.g. fragments, shrapnel) on the deformation and damage to composites. 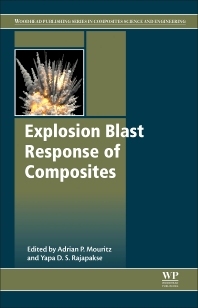 The book considers the blast response of laminates and sandwich composites, along with blast mitigation of composites (including coating systems and energy absorbing materials). Broken down under the following key themes: Introduction to explosive blast response of composites, Air explosion blast response of composites, Underwater explosion blast response of composites, and High strain rate and dynamic properties of composites, the book deals with an important and contemporary topic due to the extensive use of composites in applications where explosive blasts are an ever-present threat, such as military aircraft, armoured vehicles, naval ships and submarines, body armour, and other defense applications. In addition, the growing use of IEDs and other types of bombs used by terrorists to attack civilian and military targets highlights the need for this book. Many terrorist attacks occur in subways, trains, buses, aircraft, buildings, and other civil infrastructure made of composite materials. Designers, engineers and terrorist experts need the essential information to protect civilians, military personnel, and assets from explosive blasts. Professor Mouritz is a world-leading expert on composite materials, having worked in field as an academic and defence researcher for over 25 years and published 5 books, nearly 20 book chapters and over 150 journal papers on composites. Dr Mouritz is a leading authority on the explosive blast response of composite materials and structures. Dr. Rajapakse is a world-leading expert on composite materials for naval ships, and has led the solid mechanics research program at the United States Office of Naval Research for over 20 years. Dr Rajapakse has led one of the largest research programs into the explosive blast response and blast mitigation of composite materials.